Let’s say you come to a wall. There’s no door or gate and you have to get to the other side. There seem to be only two options: smash your way through the wall, or climb it and hop down on the other side. They both require work, but one requires less — and accomplishes the same goal. It’s called working smarter, not harder. And though many people give it lip service, very few people follow it. Including, perhaps, you. And you can figure this out by asking people one question: is sleep a priority? Because honestly, if you want to be more productive at anything, you need to figure out how to sleep better. It runs counter to everything we think about work and climbing the corporate ladder. It does, I get it. But putting in 12 hours of work a day when you’re running on empty is nowhere near as valuable as 6 hours at your best. You know what you can accomplish when you wake up feeling refreshed. So why is it still not a priority? Sleep is shockingly important. I say that because we all know how much sleep we’re supposed to be getting. We’ve experienced first-hand the benefits of logging enough zzzs. But most of us aren’t aware of the full, and lasting, implications of cutting short your time in bed. Want to know how much you undermined your own college education? 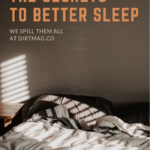 Read Why We Sleep: Unlocking the Power of Sleep and Dreams and discover just how much lack of sleep shuts down learning and information retention. It’s well studied that sleep deprivation impairs our emotional processing, too. That means basically nothing good comes of trying to interact with the world and people when you’re tired. They’re also finding a correlation between sleep loss and Alzheimer’s. But the most basic, least terrifying, part of this is: you function your best when you sleep enough. Across the board, people. Mentally, physically, emotionally, cognitively, we need sleep to perform. Simply put, fatigue is like the check engine light in your car. You can’t keep driving with it on and ignore it. If you don’t fix the problem, a breakdown is inevitable. Applying every single technique for how to get a good night’s sleep isn’t realistic. There are some areas that may not be an issue for you. (If that’s true, great!) And some of the methods might not even work for you. The point is to cobble together a nighttime routine that helps you with your unique sleep issues. Use 3, or 7, or maybe just 1. Just experiment until you find your own perfect night’s sleep formula. Magnesium is the relaxation mineral, according to Dr. Mark Hyman. This miracle mineral helps us loosen up mentally and physically. So in additional to soothing muscle aches, it can also help you drift off to sleep. Many of us don’t get enough of it through our diet, though. Even worse, we’re flushing it out of our system quickly with caffeine, alcohol, and chronic stress. Luckily, magnesium supplements are relatively inexpensive, though you need to be careful about getting a bioavailable form of the mineral. And, sure, you’ve been told to reach for melatonin when you need to get to sleep. The problem isn’t with melatonin, but rather how the supplements are formulated. We make nuanced amounts of the hormone naturally. Supplements, on the other hand, use a rather heavy hand. So they’re not mimicking your natural production to help ease you to sleep in a way your body would. Most people can name only two herbs for better sleep: lavender and chamomile. While those two are wonderful options, they might not be the best choices for everyone. Magnesium and melatonin are far from the only options when it comes to how to sleep better by using a supplement. But, please, skip the sleeping pills. They aren’t the solution for how to get a good night’s sleep. Those medications put you in an unconscious state, which is not actually sleeping. That’s why all too often you feel irritable and hungover after taking a sleeping pill, not well rested. Plus, they’re habit-forming. But there are natural supplements you can turn to. Options range from camomile and lavender, some of the best known herbs for relaxation and sleep, to the amino acid l-theanine. But you’ll need to try each of these natural supplements for sleep separately. It’s the only way to judge which work for you, and which don’t. It’s a process, but there is a good night’s sleep at the end of the tunnel. It’s worth noting that no supplement can guarantee you peaceful sleep. But in combination with lifestyle changes and good sleep hygiene, they can help. A good night’s sleep actually starts in the morning when you get up. If you’re wondering how to get better sleep, start here. There are easy ways to tweak your day that can all add up to better zzzs logged at night. Also known as the benefits of walking your dog. 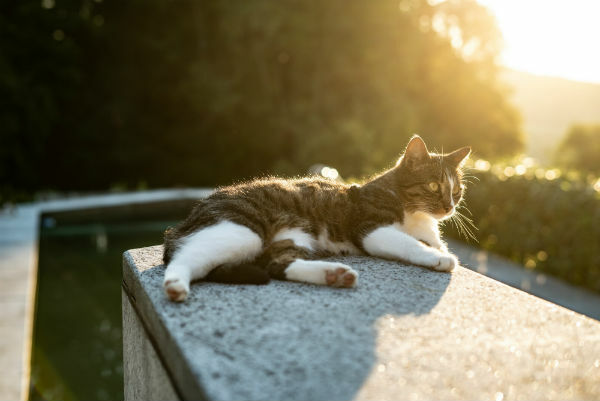 Getting sunlight in the mornings helps your body regulate your circadian rhythm. Studies show that bright light during the day does help you sleep better at night. That can prevent that “wired but tired” feeling so many of us suffer from in the evenings. (When you’re tired from the day and you know you need to go to sleep, but your brain just won’t turn off.) Ideally, you should get an hour of direct sunlight in the morning. While your schedule might make an hour impossible, shoot for 30 minutes for an increase in quality sleep. There’s another condition, though. You’ll also need to go out without sunglasses. You have photoreceptors in your skin but also your eyes. You’re going to want as many as possible to get the direct sunlight, which means skipping the shades. When your eye senses light, it talks to your brain. And essentially it tells you to shake a leg and seem awake. That’s a very good thing in the morning, but as you’ll see later, a terrible thing at night. It’s simple: we need bright light in the morning and throughout the day to regular our sleep cycle. Studies have shown this works, even in people with insomnia. 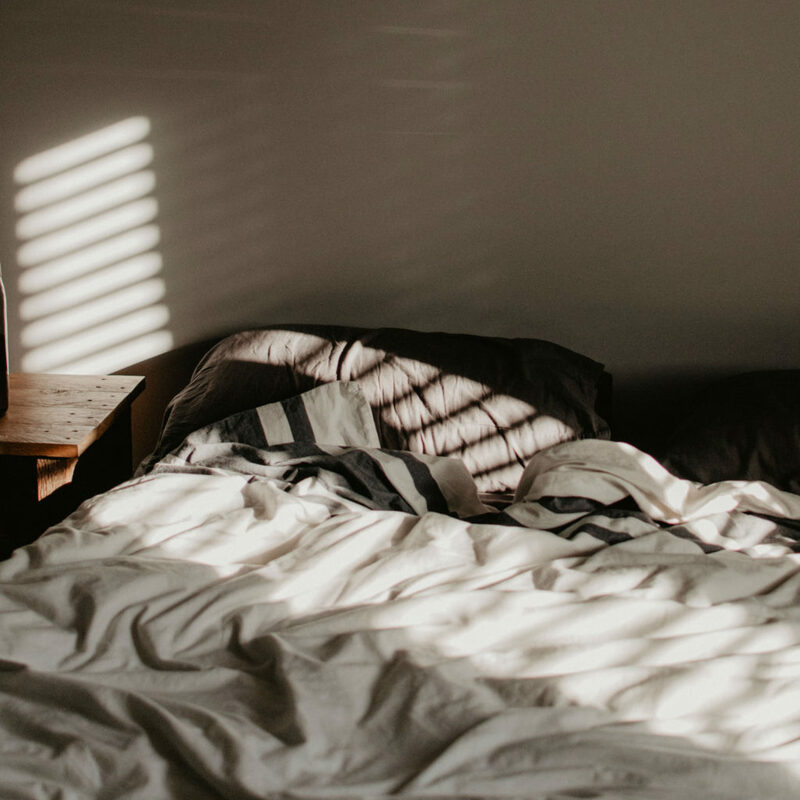 Exposure to daytime bright light increased sleep quality and duration in participants with insomnia in one study. Even better, it decreased the time it took them to fall asleep by an impressive 83%. Let me make this crystal from the beginning: I’m not hating on caffeine. Yes, I’m cutting down my own consumption. But no, I’m not thrilled about the process. Coffee is delicious. And a vast majority of us consume caffeine; 87% of people in a survey representative of the US population, to be exact. And in the right quantities it has great health benefits, from increased focus and energy to enhanced sports performance. But it’s exactly those things we love during the day that keep us up at night. And the window in which caffeine can affect your sleep is larger than most of us believe. Caffeine consumed even 6 hours before bed had a significant, negative effects on sleep, a study showed. If you’re drinking coffee or soda for the taste, reach for decaf or caffeine-free in the afternoon. You don’t have to sacrifice flavor in the same of sleeping better. Yes, I know, you’re busy. And, no, you can’t do everything. But sleep isn’t where you should carve out more hours for work. In fact you need sleep more than the next person if you have more to get done than they do. So start a routine of getting to sleep. You’ll quickly see how a good night’s sleep helps you perform at your best. And if you really are driven by productivity, that will be all the proof you need to stick to your new routine. It’s basically a terrible coincidence. The light that works best for our beloved pieces of technology is the same light that tells our brain to stay awake. So even if you think watching a late-night show is helping you wind down, it’s not. The blue light you’re taking in is telling your mind it’s time to be up and active. Your body, however, knows otherwise. That’s why you’ll get that “wired but tired” feeling. Exhausted from the day, your body wants sleep. Perked up by the blue light coming out of your TV, your mind wants to be awake. Your natural melatonin levels also take a hit. It’s a recipe for sleep disaster. If you really want to get better sleep, take it one step further and invest in some blue blockers. The sleep-promoting glasses have moved well beyond the first designs, too. That means you can get a pair of Warby Parker-inspired frames with barely-colored lenses. Enthusiastic Amazon reviews for some of the styles even mention getting repeated compliments on the glasses. Do you need to check your email on your phone 10 times a day? Or could you make it 5 and shift them earlier in the day? Simple steps like this can cut down on the amount of blue light you’re exposed to in the evenings, improving your sleep. Although people working desk jobs can’t cut down on their computer time, there is some middle ground. Cutting down on phone time is one option. Blue blockers are another. There are even apps you can download that slowly transition your screen from blue to red. That way a quick scroll on Instagram doesn’t do as much damage to your melatonin levels. It’s no secret that sleeping in summer is miserable without a strong AC. But our bodies are a little pickier than we think about temperature in the bedroom. Though you might easily drift to sleep in a balmy 74 degree room, you’re not logging your best rest. If you’re wondering how to sleep better, try turning down the thermostat to around 68. Colder if you can take it. Keeping your room between 60 to 68 degrees actually stimulates the production of melatonin. And, bonus, this is also the same range at which your body converts the most white fat (the stuff you can pinch) or brown fat (which is metabolically active and burns more calories). Your pet does love you, but they don’t care about whether you’re getting quality sleep or not. If they want to knock something over or play at 2am, they will. The snoring. The lip-smacking. The shifting and reshifting. No, it’s not the significant other, it’s the dog. Keeping you up. Again. Even if fido does a good job of drifting to sleep when you do, it shouldn’t be in your room. Same goes for cats, feline lovers. Yes, they’re cute and cuddly, but they also move a lot. They’re not bound to a sleep schedule like you are, and there’s a myriad of ways they can wake you up. And even if you love them too much to be honest, pet owners did dish on the nightly disturbances. Mayo Clinic Sleep Disorders Center found that about half the patients in one study had a dog or cat. Of those people with furry friends, 53% reported that their pets disturbed their sleep in some way, nightly. Meaning it isn’t a one-off thing. Invest in a cozy cat or dog bed, tuck them in, but head to the bedroom alone for better quality sleep. OK, let’s be realistic here. Giving up drinking altogether in the same of a good night’s sleep is just not going to happen. You’re going to go out sometimes. An after-work drink might be exactly what you need on occasion. That’s OK. But if you’re reaching for the bottle to help you fall asleep faster, you’re actually sabotaging your own efforts to get better sleep. Your go-to tipple might help you fall asleep, but it’s not going to keep you asleep. And that’s a problem if you’re trying to figure out how to get good sleep or how to sleep longer. Knocking back a couple drinks can actually make sleep disturbances like sleep apnea and snoring worse. (So you might be disrupting your partner’s sleep more, too.) And, like blue light, alcohol messes with how your body produces melatonin. But that’s not the only thing your evening drink is doing to your body. The alcohol also decreases your human growth hormone (HGH) production, which increases naturally at night. HGH essentially works wonders for your body and also plays a role in your circadian rhythm. Which means it’s not something you want to interfere with. You can’t control the traffic if you live in a big city. (Bummer, we know.) But the sounds right outside your window can interfere with your sleep. They do more than that, too. Outside noises can affect stress response and increase concentration problems in addition to sleep quality. Sleeping with earplugs can help, if you’re into that sort of thing. But if you struggle to fall asleep with something jammed in your ears, consider a white noise machine. Unlike those noise machines that spew jungle sounds, these drown out sleep-disrupting noises with ambient sound. It’s sort of like a low shushing sound that quickly becomes background noise. This one is especially important if you’re trying to figure out how to sleep through the night. If you’re a light sleeper, you need to anticipate noises. You neighbor might come home late or your cat could knock something over. A white noise machine creates a buffer, just in case. So if someone or something does make a noise, it’s less likely to take you up. Food does affect sleep, but the data on the particulars are mixed. In one study, a meal containing carbs consumed 4 hours before bed helped people fall asleep faster. But sleep was improved by a low-carb diet in another. Diets are remarkably individual. If you’re starting to think about the keto diet and celery juice challenge in terms of your unique likes and metabolism, then think of your pre-bed meal that way, too. Log your meals with a free program like MyFitnessPal. In the morning, take some notes about how you feel and how you think you slept. Or consult a sleep tracker, if you have access to one. On similar days, try testing the carbs. Collect data on how you slept. The results may surprise you (and help you get better sleep). OK, so maybe it’s not your sleep hygiene that’s the problem. If you’re physically tired at the end of your day but your head runs wild with worry, this section’s for you. It is possible to get a good night’s sleep with anxiety as long as you have management strategies. We’ll go over those in a second. But please take two minutes to think about how you feel throughout the day. If you drag yourself along all day and then feel “on” at night, that could be something more serious. Several health conditions can cause this “wired but tired” feeling, and it’s worth checking with your doctor. You might even consider purchasing a cortisol test online. The results should tell you if something is off with your cortisol awakening response (CAR), which can be indicative of larger problems. Getting better sleep and managing your anxiety have a lot in common. The most effective way to improve both is long-term lifestyle changes. I know that’s not what you want to hear. But there are strategies you can try today if you’re wondering how to reduce anxiety now and in the future. Applying even a couple is only going to make these tips for better sleep more effective. Anxiety before bed is tricky. You think it’s lulled and you’re headed for a good night’s sleep and then suddenly you’re worried about where your passport is. It can be even worse if you’re a habitual list-maker. But that’s what the notebook is for. When your mind starts running to all the things you need to do tomorrow, reach for the notepad. Jot down everything you need to get done so you won’t forget it, then put it away. Physically writing these things down is like a safety net for your anxiety. You know you won’t forget because you wrote it down. This puts an end to some of the rumination that can happen at night. But it might take some time. And you might have to reach for your notebook more than once each night, especially if you’re new to anxiety management. Keep at it. If you have access to an herbalist, take advantage. While there’s no shortage of herbs and adaptogens that can help with anxiety, they all function differently. And people experience the effects in various ways. That means one herb might make someone else feel energized, but help you fall asleep faster. An herbalist can help you through this identification process. They can also help cobble together blends of fast and slow-acting herbs for a signature combo. 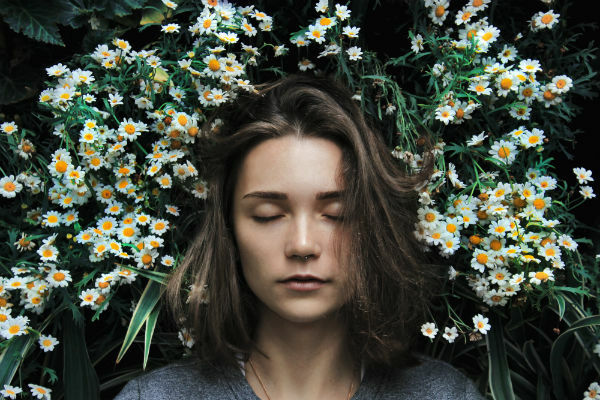 If you’re looking for more information about the possibilities, and some tips from a herbalist, check out our guide to herbs for anxiety. We talked to a clinical herbalist and she gave some vital tips and dished on her favorite stress-busting plants in that piece. Anxious people should all be meditating — in some way or another. And though we understand if you prefer walking meditation to regular, try the traditional right when you get in bed. It will take some time, but you do need to practice putting away your thoughts before bed. Most meditations will ask you to recognize your anxious thoughts but then bring your attention back to your breathing. It should help you clear your mind before bed and may even trickle into your waking hours. In fact, even the military uses a meditation sequence to help its members fall asleep quickly, almost instantly even. This simple breathing technique is gaining fans across the country for its ability to, well, knock you out at night. All you need to do is breathe in for a count of 4, hold it for a count of 7, and let it slowly for a count of 8. If you’re prone to stress and anxiety, you’re probably under-breathing. Yes, really. When we’re stressed, we breathe shallowly, into our chests. Sometimes we even hold our breath when we’re trying to get something done. This breathing pattern forces you to get oxygen into your system and simultaneously slows your heart rate. This can switch you from “fight or flight” mode into “rest and digest,” so you can calmly drift off to sleep. If you’re not practicing some sort of meditation, whether it’s visualization or breathing techniques, you’re missing out on one of the easiest ways to fall asleep fast. Release the tension in your shoulders and drop each one down as far as they will go. Next relax the muscles in your upper arm and then lower arm, one side at a time. Sound a little too involved you for? You can also try the 4-7-8 technique outlined above. Fans claim the simple breathing technique knocks them out in a matter of minutes, even on the first try. It could be your key to fall asleep in 2 minutes, like you’ve always dreamed. But maybe you’re wondering how to sleep better at night because you get up multiple times and find it hard to fall asleep again. Yet again, this is another time when the 4-7-8 technique might be helpful. Its proponents claim it can help solve this problem, too. But what if it doesn’t work? That’s when you fall back on sleep hygiene. The trick is to get out of bed if you’ve been trying to fall asleep for 20 minutes. If you haven’t fallen asleep, you’re likely getting anxious about being awake. And, as you can imagine, that’s only making it even harder to finally drift off. Sleep specialists don’t want you associating the bedroom with anxiety, so you remove yourself from the room. It’s also essential that you do something that doesn’t involve blue light. You could read, or work on a crossword, or even start the great American novel on a notepad. But if you turn on a TV or a laptop, you’re going to mess with your melatonin and make the matter worse. Eventually you’ll feel sleepy again, and only then should you reenter the bedroom. You might have to repeat the process a couple times in a night if you’re having a really tough time. That’s OK. What’s important is that you keep removing yourself — and, therefore, the stress — from your bedroom.